This piece originally appeared on the blog of Now I Lay Me Down To Sleep, and is reposted here with their permission. Kelley was there to comfort my husband Rob and me. Then entered our nurse Jessie. Kelley and Jessie helped us bathe David. When we had trouble dressing him, they helped. I even was able to get pictures of Kelley and Jessie and their interactions with David through Now I Lay Me Down to Sleep. It is because of Kelley I have this image of my son David. She absolutely loved his thick, dark, curly hair and even told our photographer Sandy Puc’ to take a picture of the back of his head. When I left the hospital the next day, I hoped I would see Kelley and Jessie again in a happier circumstance. I got pregnant shortly after losing David. We were full of hope because we were told what happened to David was a very rare occurrence. At our 16-week ultrasound, we learned that our second baby Ethan had hydrops and cystic hygromas, which is severe fluid build up around all his little organs and cysts on his neck. We went to our OB, Dr. Shilling (who gave us great care) every week to see if Ethan’s heart was still beating. Nurse Barbie was our nurse when we went to Dr. Shilling. Barbie was there when we went in for check ups with David and she was there with Ethan. Each time, she cried with us because she has such a compassionate heart. 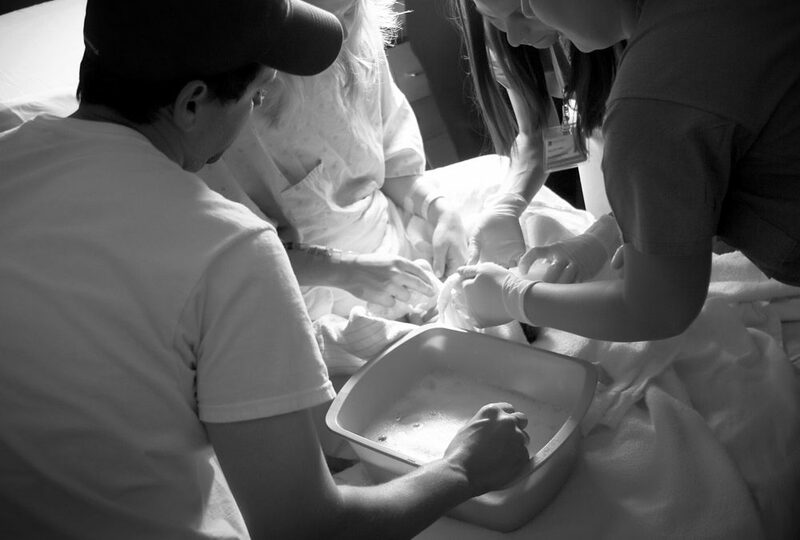 On June 18, 2008, at 24-weeks gestation, Ethan’s heart stopped and Barbie was there to cry with us. We went back to the same hospital for an induction. Kelley and Jessie were our nurses again. They remembered us. Again they showed the same care as they did when we had David. Devastated, Rob and I did not know what we would do. A geneticist said that it was likely we would not be able to have a healthy boy, but they were not certain what the issue was. I pictured my life 10 years from that point realizing that I would be too old to try for a baby again if I changed my mind in 10 years. I asked myself, “Would I regret not trying one more time?” I knew I would regret not trying again. I got pregnant not one more time, but two more times and each pregnancy ended in a heartbreaking miscarriage. We learned about each of our miscarriages when we saw Dr. Shilling and our nurse Barbie was there each time for a shoulder to cry on as tears streamed down her own cheeks. By this point, we had no idea what we were going to do because we had lost all hope in having a healthy baby. In October 2011, I left my position as an executive director of a nonprofit that I had been with for 12 years to become the CEO of Now I Lay Me Down to Sleep. Without any planning, I became pregnant again. I was extremely nervous about how I was going to walk through a pregnancy where the odds were that my baby would likely die. Working at an organization that served parents suffering the death of a baby made it even more challenging. At the appointment, the unexpected happened…..Our baby was completely healthy! And, he was a BOY! I don’t think my husband and I had ever experienced so much joy in my life up to that point. The next week, I went back to see Dr. Anderson. I was in a big waiting room and Barbie was walking through. I went over to her and told her the news that the baby was healthy and he is a boy! In front of many patients, she grabbed me in a huge embrace with tears streaming down her cheeks. She was as excited as a family member was for our healthy boy. At 37-weeks, I began having contractions. My husband and I went to the hospital. When they put us in the initial holding room to see if I was in labor, Kelley and Jessie walked in. It had been almost five years since I had first met them.They both remembered us. Even more so, they remembered David and Ethan. They assured us that if I were admitted that night they would make sure I would not be in the same rooms where David and Ethan were born, unless we wanted to be. I couldn’t believe that they not only remembered us, but they remembered the rooms we were in. It turned out to be false labor pains, so I was sent home. A few weeks later, my water broke and we headed back to the hospital. This time, we had completely different nurses. I asked about Kelley and Jessie, but they were not working for several days. How could I not have them there? The labor and delivery was very scary because our son’s heart rate was going up and down. RJ (short for Robert David Harris, Jr.), went meconium and I had not dilated past 6 centimeters for many hours. It was time for an emergency C-section. RJ was born and completely healthy! Dr. Anderson was not there to deliver him, but she stopped by to see RJ the next day. She then asked if she could take a picture of RJ and text it to Dr. Shilling. Of course I agreed. He text her back immediately and said that this made his career. Recently when I was in touch with Dr. Shilling, he had emailed me the following: “When you are retired after practicing medicine for most of your adult life, you look back and hope that you have done some good. While most of practicing medicine is fairly routine, patients such as yourself and others with difficult medical situations that you are able to help with are what make it all worthwhile. I will remember you, Rob, David, Ethan and RJ, by name, for the rest of my life. It helps me to reassure myself that I made a difference.” It still chokes me up to read this from him. To circle back to nurse Kelley. My first nurse. The nurse I really clicked with. 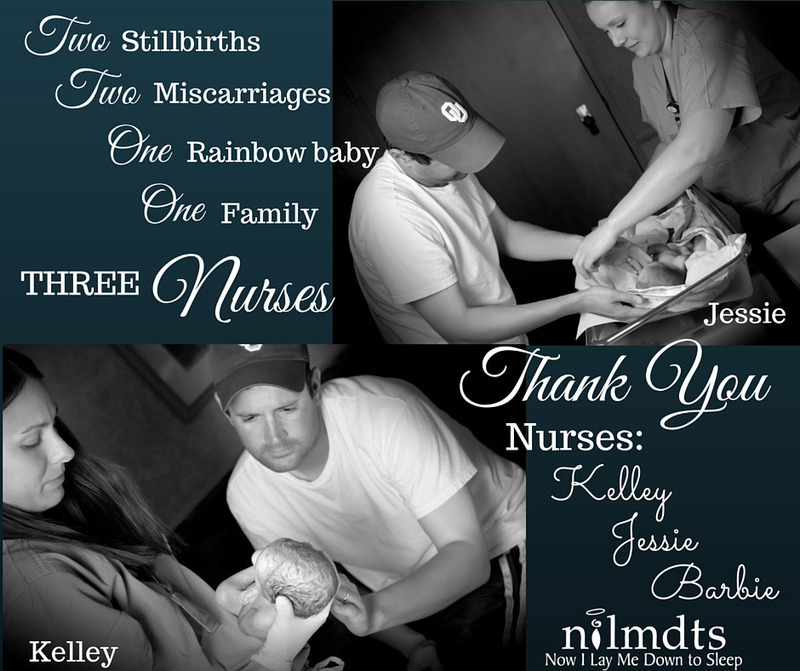 Kelley was not my nurse with RJ, but she had in-service on the last day I was in the hospital with RJ. She had heard I was there and she made a special trip to my room to see Rob and me and even more importantly to see the miracle little brother of the two boys she helped deliver – David and Ethan.Thank you to Nurses Kelley, Jessie, and Barbie and Dr. Shilling and Dr. Anderson for being part of our healing journey. I would like to personally thank all nurses and medical providers for the care you give to so many. I know you do not get thanked enough. In most cases you never see the patients you care for in the past, so thank you from the bottom of my heart! #notjustanurse #justanurse #showmeyourstethoscope If you would like to help Now I Lay Me Down to Sleep continue to provide this precious gift of remembrance photography to other families, you can make a donation of any amount here.